Lawn Care Buxton Maine - PCU Enterprises Serving 35 Years! Lawn Care Buxton Maine – PCU Enterprises Serving 35 Years! PCU Enterprises Lawn and Grounds Maintenance. Serving Lawn Care Buxton Maine needs. Southern Maine choice for Expert grass cutting – Since 1984!! Yes, at PCU Enterprises Lawn and Grounds Maintenance we have provided lawn care services to Buxton, Maine since 1984! Moreover; we also provide services to neighboring communities. If you live in Buxton, Maine we would appreciate the opportunity to serve you. Indeed; PCU Enterprises has served the lawn care needs of Buxton and Southern Maine with Prompt, Personal, Professional service! So; we bring experience to your yard. We offer a variety of services. Indeed; We provide professional seasons grass cutting for the season. And our fussy Fall cleanups will leave you feeling right about your yard. Moreover; you’ll go into the winter confident that your lawn won’t have a dense mat of leaves. And of course, Spring yard cleanups are always needed in Maine. Furthermore; It’s essential that you call us early for these services. Because; requests for assistance at the last minute can often affect cost and service outcome. Want to improve your lawn? Yes, annual dethatching can remove your cluttered mat of thatch keeping it from absorbing water and nutrients effectively. Additionally; yearly over-seeding will build that healthy dense lawn many of us envy. And a lawn renovation should be done every few years or so to bring a neglected landscape back to life. Furthermore; a vital part of building a healthy thriving lawn healthy and is a fertilizer program. We offer organic and organic based as well as straight fertilizer programs. Similarly; annual lime applications are required to keep PH in balance. 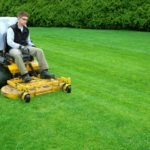 PCU Enterprises Lawn and Grounds Maintenance offers many more services not listed above. So; feel free to click onto our home page, or you may visit our sister company below. Just [Click] and your there!